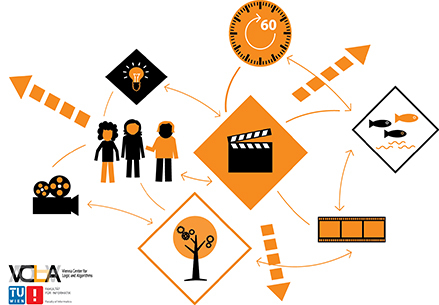 The video competition is nominated for the eAward 2019. The 20 videos which came among the finalist of the competition have been presented at the 11. Informatiktag, at University of Vienna. More here. The details of the award ceremony are revealed here. Featuring of the Top 10 Videos on “Algorithms in 60 Seconds” on Youtube starts on June 11, 2018. Between June 11th and June 22nd, the TOP-10 videos in each category that have been shortlisted will be featured on the VCLA YouTube channel. However be aware, we will not tell you who the winners are. They will be announced at the award ceremony on June 28th. The jury had a very difficult task to select the winners among so many good videos, whereas not everyone could be considered for the prizes. Therefore, the 10 videos from each category that have been shortlisted will be released before the award ceremony on the VCLA YouTube channel. We are pleased to announce receipt of 95 applications for participation in the video competition ,,Algorithms in 60 Seconds”, representing altogether almost 300 participants. 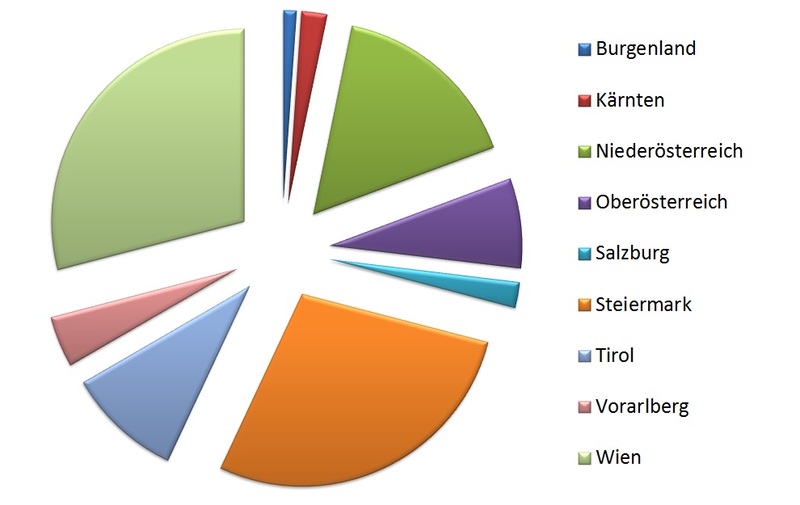 The graph shows the registrations (individuals and classes) by Austrian federal states. The VCLA thanks all individuals and teachers for their participation and is pleased to welcome the participants to the award ceremony in Vienna in the last week of June. VCLA thanks the supporters of the competition: eEducation-Austria, bmvit INFOTHEK, Future Learning Lab Wien and Science Center Netzwerk; who work relentlessly every day to create playful formats for fostering of computational thinking, media skill-set and critical reflection on the interplay between the digital technologies and the society. Special thanks to the networks and the people who helped to make this truly a nationwide competition: fti…remixed, Young Science, talentify, Teach For Austria, UniClub-UniversitätWien (für Jugendliche ab 13), Wiener Bildungsserver, Medienbildung JETZT, FIT WIEN NÖ BGLD, Onlinecampus Virtuelle PH, Lehrer-Online, ECDL Austria, Schule vernetzt! Österreich, schule.at, Schülerunion Österreich, FNM – Austria, DER STANDARD. Registration for the Video Competition expired on April 25. The making of 60 seconds long videos, which answer one of the 5 questions of the competition, should be submitted by May 15. Vienna Center for Logic and Algorithms at TU Wien is exciting to announce this initiative to encourage computational thinking in a playful format. Video competition „Algorithms in 6o seconds“ is an Austrian nationwide competition to engage not only teenagers, but also school children to reflect on the nature and application of algorithms that are shaping our world and the future of the digitalized society. To enter, individuals or groups can submit a video (maximum 60 seconds long) in animated or live action technique trying to answer one or more of the proposed 5 questions of the competition. The competition will award the most creative submissions with cash prizes (6000 EUR award fund). Remember, the video is to be in any language or not at all, and the more creative the better!